The southern coffee growing areas of Colombia’s Huila department produce some of the most dynamic, complex profiles we’ve seen in Latin America. Small-holder farmers represent the vast majority of Huila’s production, and the cooperative structure has been enormously effective in bringing their coffees to the specialty market. ASPROTimaná coop was formed in 2001 by 38 original farmer members. 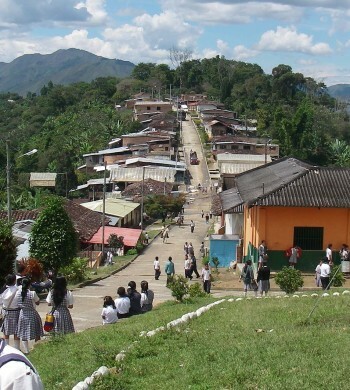 Socio-economic stability for coffee farming families was the catalyst for this organization. Even in the early days of specialty coffee, these farmers knew that better market access was the key to the stability they sought. Today, ASPROTimaná has around 850 farmer members from 22 villages around Timaná, with more joining every year. Atlas was introduced to ASPROTimaná in 2011, and the coop’s General Manager Robinson Figueroa was our first point of contact there. Robinson’s vision is the same as that of the original founding members: Establish dependable, long-term relationships with buyers willing to pay fair premiums for top quality. Atlas’ goal is very much inline with Robinson’s, and our first purchases from ASPROTimaná found immediate homes with happy roasters. Since that introduction, Atlas and ASPROTimaná have enjoyed many successful years of business together, fostering mutually beneficial relationships between farmers and roasters that continue to thrive. Robinson also happens to produce some incredible coffee on his own farm, and his relationships with his buyers serve as a model for what other cooperative members can achieve. The location of most of the coop members’ farms, relative to the Magdalena River and the central mountain range, significantly influences the weather and harvest timing. ASPROTimaná’s main harvest tends to be October through December, on the opposite side of the calendar from most of Huila. The astounding diversity of micro-climates around the small town of Timaná makes for an equally impressive array of flavor profiles. Coffees from ASPROTimaná can run the gammut of heavy, tropical, fruit juice flavors, marmalade, limoncello, ginger, citrus zest, dark berry and molasses.